The nature of fashion is unforgivingly cyclical. As an industry, it’s constantly refreshing itself – conglomerates, designers, and brands trying to create clothes that secure their footing firmly at the top of the wheel of fortune, only for them to fall from grace and end up back at the bottom. Nowhere is this more clear than at fashion week, where hosts of editors and street style stars model the latest must-have “it” items from current collections, with this season’s shows a veritable parade of Vetements jeans, J.W.Anderson “Pierce” bags, and bedazzled Gucci everything. But at the moment, something else is happening – our attention is being subverted from what’s ‘hot’ to what’s decidedly not. The uncool is becoming cool, precisely because it is uncool. The items you once cringed over are back, and they’re being cosigned by the biggest designers around. Just look at London Fashion Week, where Christopher Kane did the almost unthinkable: he took Crocs from their current dusty dwelling space in your dad’s garden shed and breathed new life into them. 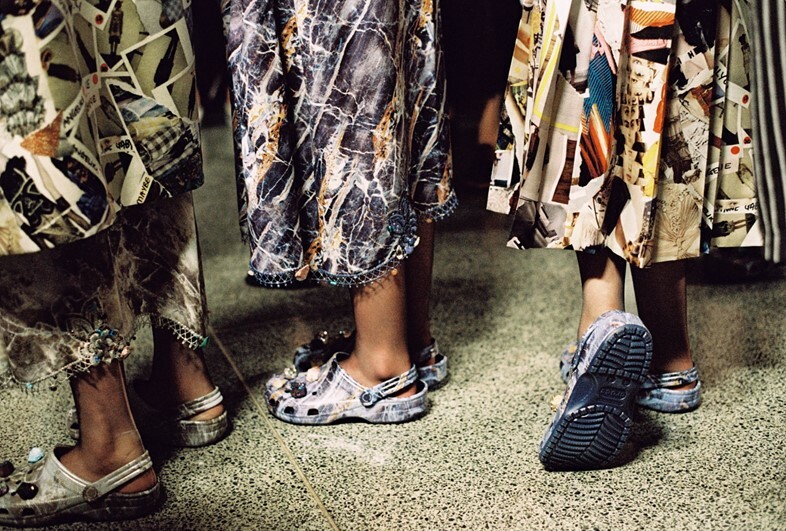 Widely derided as the worst shoes ever – with the company having recently shuttered stores amidst falling sales – the rubber clogs appeared in the designer’s SS17 show in marble hues, accessorised with gemstones. “I always work with unexpected items and combinations, transforming the everyday into desirable luxury,” Kane was quoted as saying in a press release, before adding that the Crocs could be worn with jeans or an evening dress. Yes, really. But Kane isn’t the only one bringing back some unexpected blasts from wardrobes past. For their recent show during Paris Couture Week, Vetements collaborated with Juicy Couture (get it), debuting a series of velour tracksuits and onesies bedazzled with the infamous JUICY text across the bum. Despite Juicy’s own recent rebranding, the tracksuits had long since fallen into the same 00s trend-hole that saw Louis Vuitton discontinue their famous multicolour monogram and Ed Hardy trucker hats doomed to appear only in Paris and Nicola circa The Simple Life-themed costumes. Aside from Kane and Demna Gvasalia of Vetements, Gosha Rubchinskiy recently debuted a collection featuring decidedly out-of-favour sportswear labels (Kappa, Fila, Sergio Tacchini), and Kylie Jenner is on an apparent mission to single-handedly bring back Von Dutch. Then there’s Instagram style icon Ian Connor, who, before his fall from grace, was spotted posing in Skechers, which haven’t been ‘in’ since Britney apparently lost them millions of $$$ back in ‘03. Although she’s been playing games with our perceptions of taste for decades, one person who could be pointed to for kickstarting this celebration of the outmoded is Miuccia Prada. For her SS16 menswear show back in June last year, Prada posited “post-modesty” – presenting “stupid, infantile” graphics like bunny rabbits and rockets as alternatives to overt branding; an embrace of the low-brow as a comment on how modesty no longer exists in our self-obsessed epoch. Championing the seemingly unredeemable when it comes to brands like Crocs demonstrates a similar kind of self-awareness – it makes a comment on the inherently fleeting nature of “it” brands and items, and instead of answering to fashion’s frenzied demand for the new, ironically resurrects what’s now seen as outdated. Our current interest in the unfashionable is like the Instagram-era version of when late 00s hipsters started wearing thick-rimmed glasses and patterned shirts, before they too were absorbed into mainstream fashion culture. Whether it's at the hands of a social media influencer or a brand, transforming something indisputably decried as bad taste into something cool is the ultimate fashion flex, a demonstration of power to shift opinion and realign perspectives, inciting desire where there was once disdain. Arguably, it’s only Vetements – having had the most stratospheric rise in fashion this side of the millennium – that would be capable of changing the opinions of fashion snobs about diamanté-branded velour. With its couture show held in a department store in tribute the way fashion is consumed outside of the industry, its Juicy tracksuit exists in a different context to that of a Newlyweds era Jessica Simpson. It’s self-aware, conceptualised, intellectualised, elevated. A postmodern symbol of the basic and banal rather than the thing itself. And that’s no offence to Juicy – I’ve spent many happy hours lounging in my monogrammed velvet two-piece. Ultimately, buying or creating something that you know objectively is out of fashion is a way to send a message that you’re above trends – the irony being that you may well end up creating one. To wear something seen as passé demonstrates a security in your own sense of style, a confidence that you can play with the social codes that exist around a garment and re-contextualise them, that the clothing you appropriate from tackiness will be read and understood by those in the circles you move in – in other words, that your mates will be in on the joke. This isn’t necessarily new; think of the posh girls who’ve moved to Peckham and started dressing in working-class signifiers like sportswear and gold chains. Not because that’s the only style they are exposed to – but because somehow it belies a gritty authenticity that their privileged upbringings do not, and rather than something to be scorned or looked down upon, it becomes regarded as stylish, as a statement. Taste is a construct. Taste exists at the intersection of systems of class, community, wealth and global capitalism, and taste (along with a disposable income) is often what determines your place in the elitist fashion industry’s pecking order. But not everyone wants or can afford to define themselves by the common consensus of what’s ‘in’, and playing with taboos around these ideas pokes fun at what’s perceived to be acceptable, demonstrating the fickleness of trends in the first place. Right now, bad taste is in, and good taste is out. Time to dust off that Von Dutch.